Asus has taken a cue from Samsung in making what it calls "the world's first quad-mode, dual-OS laptop." 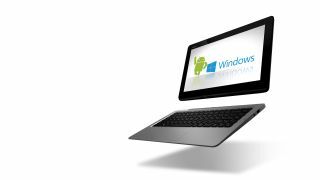 The company is referring to the Transformer Book Duet TD300, a 13-inch detachable hybrid laptop that runs both Windows 8.1 and Android… 4.1. Weird, but intriguing, the roughly 1.12-inch thin Transformer Book Duet can switch between Windows and Android with the press of either a physical button on its keyboard dock or a virtual button on the 0.5-inch thin tablet. With a 13.3-inch, 1920 x 1080 IPS touchscreen, this hybrid laptop runs on up to an Intel Core i7 chip. It's this laptop-grade chip that allows for smooth, seamless switching between operating system, ASUS says. The TD300 has ASUS making all sorts of claims, like that this hybrid rig is twice as fast as competing ARM-based tablets. Backing up that CPU are up to 4GB of DDR3 RAM and the user's choice of either an SSD as large as 128GB or a hard drive of up to 1TB in size. Couple that with 802.11ac Wi-Fi, Bluetooth 4.0, and a front-facing HD webcam, and the TD300 ups the ante for a would-be iPad Pro. But wait. Check out the physical connections on offer: a 64GB microSD card reader and headphone jack on the tablet, with three USB ports (one 3.0), Ethernet, HDMI and audio ports on the keyboard dock. Since Asus's patented OS switching technology is not virtualized (think VMware or Parallels), it allows for switching between open Android and Windows apps on the fly. Together, the tablet and keyboard dock weigh 4.18 pounds, making for a light and portable, Asus says. We'll be the judge of that – and get pricing and availability information – once we get our hands on the Transformer Book Duet on the CES 2014 show floor. Crave more CES 2014 goodness? Come and get it.